Cambridge to Sue Beel and Sue Pitcher on behalf of our volunteers. 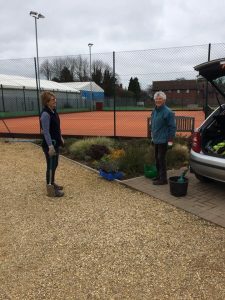 Jacqui West our Maintenance Manager and a host of members were busy on a variety of jobs to keep our courts, clubhouse, flower beds and car park tidy. Thank you to all our members for your help. On Friday 1st March we held a tournament with a difference. Sixteen players took part in an adult doubles tournament on mini-courts, using smaller rackets and softer balls. Matches were timed so play was fast and furious with all pairs aiming to score as many points as possible during each of the 7 rounds. Scores were close with just one or two points deciding many games. The ladies partnership of Wendy and Nicky were the eventual winners, in their match against second place Tom and Lucy there was just one point difference. Following the tournament players enjoyed a buffet in the clubhouse. Mini-Court tennis is proving popular at the club during the Saturday afternoon Social Sessions. If you would like to try tennis for the first time or are looking to return to the game pop along anytime after 1:30pm on a Saturday afternoon. 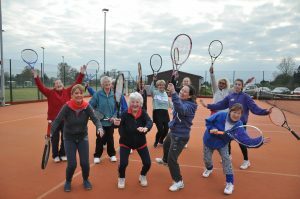 Wisbech Tennis Club is fund raising to create two new tennis courts. There are a variety of fund raising events happening over the next few months, but if you find that you have a busy schedule then one way to contribute is through the 100 Club. This will cost you £5 each month and you may win something as well. At present the 100 Club has raised money to provide posts and nets etc for the new courts but would like to help pay towards the cost of installing lighting for these courts. 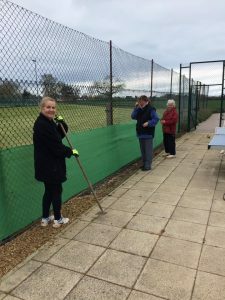 Please take a look at our website www.wisbechtennisclub.org.uk (under 100 Club) which has information on how to join and help contribute to our fundraising campaign. Details of our Sunday Matchplay Event on 27 January and February Half Term Camp on Monday 18 February. The matchplay events will be divided into 2 categories; 8 & under and 9-16 years. The 8U event will be an informal competition where children get to learn how to play matches as well as have a chance to compete in a friendly environment against their peers. The 9-16 years event will be a team competition (dependent on entries) where players will be placed into teams with the aim of players competing against others of a similar age/level. Bookings are now open for both the Matchplay Event and the half term camp at https://on2court.co.uk/venues/wisbech-tennis-club . Closing date for the January Events is Thursday 24 January. We do ask that if you plan on attending either or both events you book as early as possible as it means we can plan and staff appropriately-thank you. I am contacting you all to clarify the coaching activity situation which will be in place in the new year up to Easter 2019. Firstly, I would like to say a big thank you to Laura Brett for running our Sunday Coaching Programme from September to December. The Club/On2Court were in a difficult position over the summer where we were left with a short amount of time to find a coach for the Sunday programme and therefore Laura helped us out of that situation. So for next term we shall be making some temporary changes to our schedule. Again, further details will follow with these camps. We therefore still have a good spread of coaching/competitive opportunities taking place at the club throughout the term. Looking further ahead, myself and the club are putting plans in place for longer term coaching provision with a view to the summer term. We understand that those of you who currently attend coaching on Sundays may be a little disappointed by this. Hopefully, even if it’s temporarily, many of you may be able to move across to a Tuesday. For those who cannot, we hope to see you taking part in the competitive events we have planned on a Sunday as well as the holiday activities. We hope you understand that this is a difficult situation for the club and finding coaches to take over part time/temporary coaching positions at short notice is extremely difficult and an issue that many clubs suffer from. We therefore hope you bear with us during this time. Finally, we would like to wish you all a Merry Xmas and a happy and healthy new year! 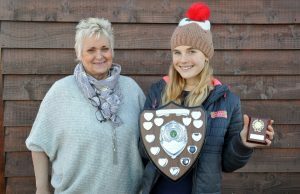 Lucy Prior 15, is pictured receiving the Peter Peukert Memorial Trophy from Mrs Fay Peukert at Wisbech Tennis Clubs junior Christmas Party held at the club on Sunday 9th December 2018. The award is presented annually to the junior player together with a memento trophy, who has shown the most improvement and commitment over the season. Lucy was nominated by the club coaches and committee, as not only has her tennis improved but she has played in her first ladies league match this season, a tournament, and regularly helps out with junior coaching. Mr Peukert, who loved his tennis and played very much for the fun of it rather than competitively, died more than 31 years ago and this award is presented annually. He was a member of the club for many years and served on the committee in a variety of roles. 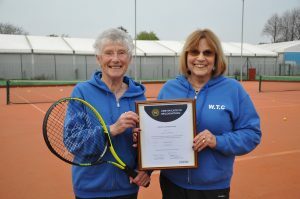 He encouraged others to play and got his daughter Sarah, involved in tennis, and the family have continued to support this award for which the club is very grateful. The children enjoyed a session of fun tennis games in the sunshine in their christmas jumpers, helped by our older junior members Harry and Alfie Goldspink and Lucy, before moving indoors to the clubhouse for more traditional games. This was followed by hotdogs, and party food and drink. Many thanks to Committee Members Jane Page, Sue Pitcher, Jacqui West, Sue Beel, Club Coach Gary Fitzjohn and Sue Tolliday for making it all possible. 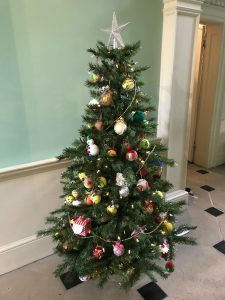 Our festive tree for Peckover House is on display in the main hall this year. Peckover is open to the public from 8th to 16th December 2018, normal admission prices apply, House, Garden and Tea Room all open with music and choirs on at selected times please see their website for more details. A very big thank you to our adult and junior members for all their imaginative ideas on decorating a tennis ball again this year. 16 players took part in a restricted mixed tournament on Friday evening. This was played on a timed 7 minute tie break with restrictions on some ‘A’ team players not partnering other ‘A’ team players. The result after 7 games was tied on points but the eventual winners on shots difference were Seth Briggs-Williams and Kitty Hall, with Pauline Maris and Gary Fitzjohn coming a very close second. A buffet tea together with liquid refreshments were enjoyed in the clubhouse after the game. Coaching courses begin this week on Tuesday 30th October, and Sunday 4th November, see the coaching tab for details and booking. 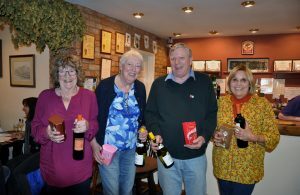 A fantastic quiz night was held at Elgoods Visitor Centre on Friday evening organised by Laura Brett for the Tennis Club. 13 teams of 4 people battled it out over 8 rounds of questions, together with a very taxing table top round on Planets, The Shipping Forecast, Monarchs, Astrological Symbols, Greek Alphabet and Weights! The eventual winners were Sue Meathey, Margaret Mee, John Westwood and Sue Pitcher who were presented with wine and chocolates. The runner up team of ‘Thinking Caps’ (who donned caps for event), Greg Page, Stuart Jupp, Will Jupp and Jason Smith were also presented with chocolates. A huge thank you to Jan Wildman for setting the questions and keeping order (with her Colander and ladle!) over the evenings proceedings. Also thanks to everyone else who helped with the event, prepared the buffet, made the wonderful cakes, and the generous donations of raffle prizes. Thanks to Belinda Sutton of Elgoods for hosting the event which raised £756 towards the funding for the new hard courts.